A fantastic house with superb indoor-outdoor flow and its own private jungle, beautifully appointed and decorated. 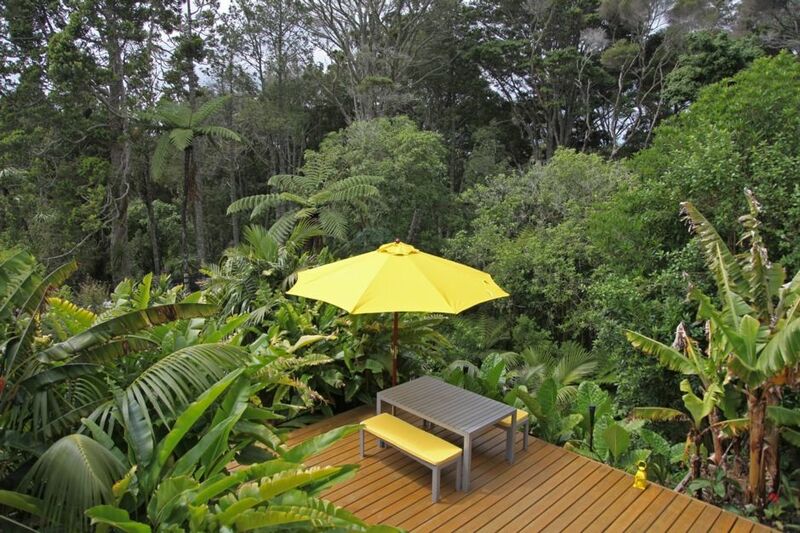 Cascading decks give the opportunity to enjoy the serene garden and the birds. Comfort and convenience in beautiful Birkenhead, close to wonderful beaches and bush walks, good cafes and only 15min from city center. If you are looking for calm, complete privacy and a special connection to nature while enjoying superb modern comfort, look no further. Cascading decks give the opportunity to enjoy the serene garden and the birds.Comfort and convenience in beautiful Birkenhead, close to wonderful beaches and bush walks, good cafes and only 15min from city center. There are 4 BEDS - hence a maximum of 8 people, ideally a combination of adults and kids as the dining table only comfortably sits 6 adults. UPSTAIRS: You will have access to 3 double bedrooms (1 queen bed, and 2 double beds—1 futon and one full height frame), 1 bathroom, a cozy lounge and a very modern kitchen, as well as three outdoor decks and a fantastic subtropical garden. Birkenhead is a very safe neighbourhood, with a center which has everything that you need (two supermarkets, post, banks, pubs, cafes, restaurants, take-aways etc.) It is also a very peaceful leafy area with native bush, the greenest suburb so close to the city; Very surprising to find this untouched nature less than 15 minutes from the Skytower. Please respect the maximum number of people including children (8), don't bring pets and don't smoke inside. No parties, no drugs, no illegal activities.